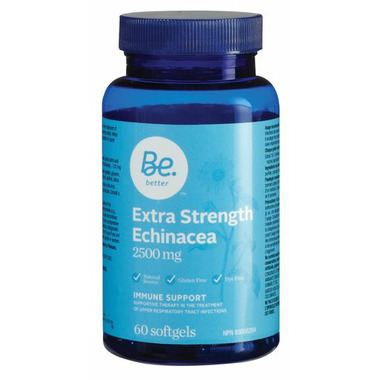 The Be Better Extra Strength Echinacea is a natural, gluten free, and dye free supportive therapy in the treatment of upper respiratory tract infections. Ingredients: Organic Echinacea (Echinacea purpurea) (aerial and roots)19:1 Extract -- 132 mg (Equivalent to 2500 mg fresh herb Echinacea), Sunflower oil, softgel capsule: gelatin, glycerin, purified water, carob), yellow beeswax, lecithin. Do not use if you are allergic to plants of the Asteraceae/Compositae/Daisy family. Hypersensitivity (e.g., allergy) has been known to occur, in which case discontinue use. Consult a physician prior to use if you have a systemic disease such as tuberculosis, leucosis, collagenosisprogressive or multiple sclerosis, or if you are taking immunosuppressants. Consult a physician if symptoms persist or worsen.